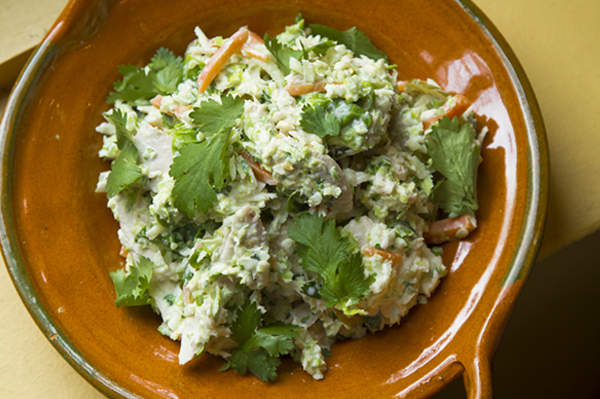 Using a mandolin or food processor, shred Brussels sprouts and place in a large mixing bowl. Add mayonnaise, salt, chicken, and cilantro. Remove 3 to 4 jalapeňos from the can, slice into rings, and add to bowl. Remove the onions and carrots and chop about ¼ cup into ¼ inch pieces, add to sprout mixture along with 3 tablespoons of the canning liquid. Stir to combine. Immediately spoon about 1/3 cup of the Brussels sprout mixture into warm tortillas and serve.